Happy to see your blog. Hope your documentation of events will be helpful for our organisation (AIIEA). CONGRATULATIONS. I feel proud myself as photographs shooted by me are also widely published through your blog . I hope there will be a close connectivity between us regarding the above subjects and your valued suggestions and advices are mostly welcome to marched on my photographic journey ahead. 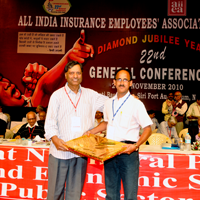 Kharagpur Division Insuracne Employees' Association. I have Inaugurated My Bolg with Excellent Phtographs shooted by You. Worker are very impressive and conveys our message. can use them in our banners for Conferences. Thank You very much for Your visit to my blog. Please share your information in future. The progams for calculation for arrears/it birucation prepared was also very useful. You work shows the commitment and hardwork. The Inspiration of AIIEA makes many things. I am nothing, Every things is AIIEA.